If we learned two things from Batman, we know that 1) if you want to become a super hero, you'll need to watch your parents get murdered in front of you (duh), and 2) caves are awesome. And while these 10 Bay Area ones may not be the secret HQ of any dudes in capes/tights, they're every bit as cool as the one Bruce Wayne's alter ego calls home. You can get your first cave fix right here in the 7x7. Head to Lands End to check out the ruins of Adolph Sutro’s former oceanside resort, the Sutro Baths. A climb down to sea level from the Lands End parking lot lets you explore a cave where you can scare yourself silly, meditate, or enjoy the occasional concert. 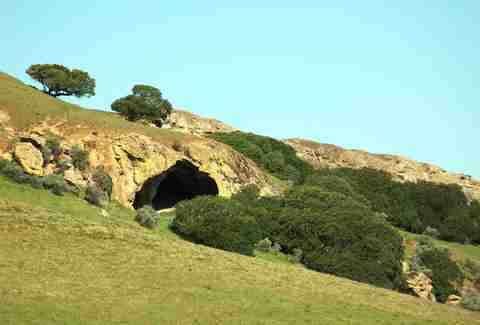 Located in the foothills of Mount Diablo, the Vasco Caves complex features Indian rock art, endangered plant and animal species, and the largest golden eagle nesting site in the world. Guided tours are required and you can book one online for just $34 a pop. A trip to Secret Cave starts with a drive to Point Reyes’s Limantour Beach. 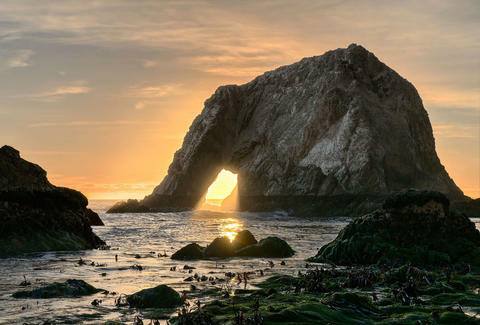 From there, hike two miles South to a rock arch that brings you to Sculptured Beach. The cave entrance is on your left just after the arch, and depending on the sand level, you can walk or a crawl in to view the amphitheater. Start your journey at the McClure’s Beach trailhead and follow the path until you reach the beach. 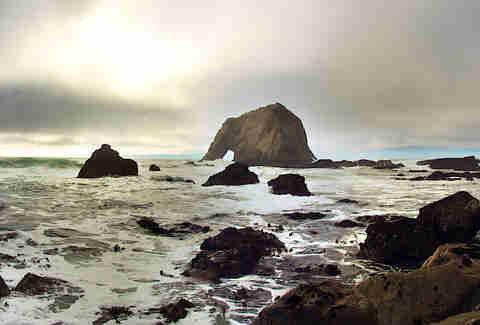 Then, take a left to walk south to Elephant Rock and the cave. To see how Elephant Rock got its name, walk past the cave area and take a look back. 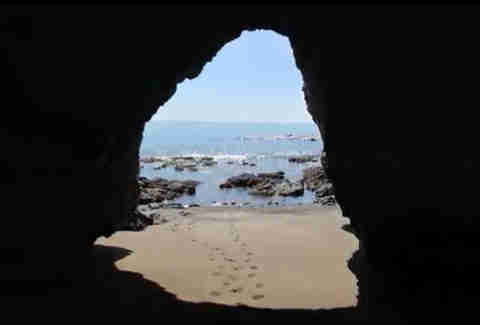 NOTE: Both Point Reyes caves (Secret Cave and Elephant Cave) are blocked off by water except at the lowest tide levels. Consult tide tables closely before visiting. You can actually get trapped in Secret Cave, so be adventurous, but also don't be stupid and get yourself hurt. 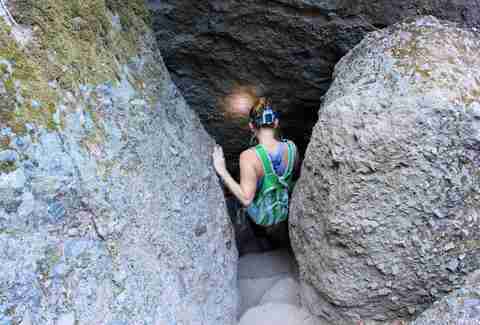 Also: water-safe clothing and water shoes are advised, as your cave explorations may look something like this. 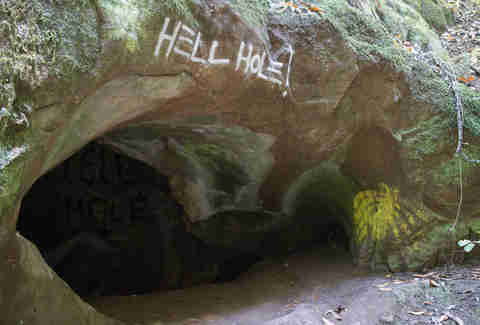 The Porter or Empire Caves are a series of three underground caves located near Empire Grade in Santa Cruz. 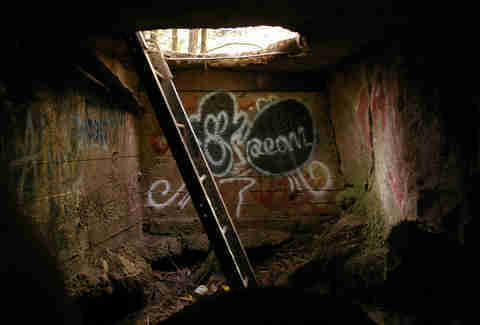 This beginner’s spelunking adventure starts with an easy climb down a ladder through a hole within a concrete block. If you don’t like creepy crawlies, take note that these caves are home to the rare Dollof cave spider and Empire Cave pseudoscorpion. Yes, pseudoscorpion. Evolution is weird. The advanced, 45min-long journey through Hell Hole Cave starts with a squeeze down a tight, 90ft descent. As you might guess, this one’s not for the claustrophobic. You’ll also need to come prepared with water, rope, slings, harnesses, lights, and extra batteries. Or you can skip all of that and just watch this guy’s solo expedition on YouTube. In this newly minted Pinnacles National Park, you’ll find the Balconies and Bear Gulch Cave trails. The Bear Gulch Cave is the largest maternity colony for Townsend's big-eared bats between San Francisco and Mexico, which means part to all of this cave is closed in the summer months when the wee little bat babies are being born. Rain and storms can also close both caves, so check cave status before you visit. Black Chasm Cavern was designated a National Natural Landmark in 1976 and has been open to the public since 2000. 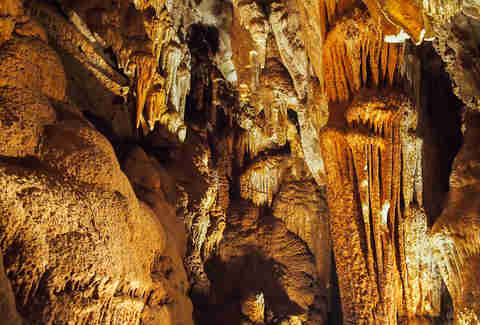 The two tours of this vertical cave include stalactites, stalagmites, flowstones, and rare helictite crystal. 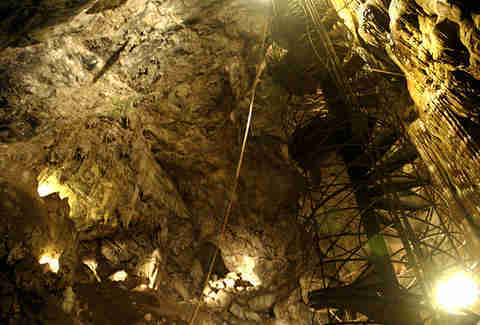 For an aboveground adventure, gemstone mining and geode cracking are also available. NOTE: Calaveras County is cave city. 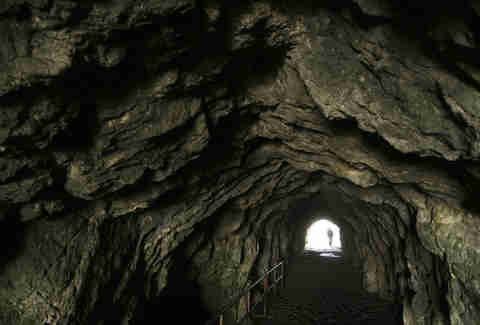 This and the following two caves can be visited with the Sierra Nevada Recreation Corporation. If you're particularly ambitious, you might even be able to visit all three of these caves in a single weekend. In 1850, gold miner Captain Joseph Taylor discovered this cave and opened it to the public. Dances and meetings were held here and Mark Twain and John Muir both paid a visit. Today, even the tame “family tour” of this cave includes a rafting segment and a walk through knee-deep mud, so make sure you’ve packed a change of clothes. At 410ft, this is the tallest public cave you can visit in California. Its name comes from a moaning sound created by drops of water that fall into a bottle-shaped flowstone formation. The bones of 100 people from as far back as 13,000 years ago were found at the bottom of the cave. It's believed that these unlucky folks accidentally fell to their deaths throughout the ages. 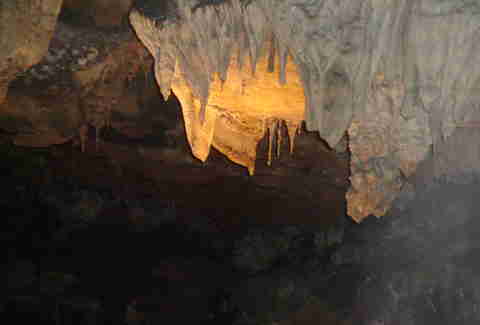 Tours of Moaning Cavern start with an optional rappel down to the cave floor. Alexandra Kenin is the founder of Urban Hiker SF. She left the tech scene two years ago to explore the stairways, hills, and hiking trails of the City by the Bay. You can find her on Twitter, Facebook, and Instagram.